The nutrients in Farrier's Formula® Double Strengthimportant for a healthy hoof are provided at twice the concentration compared to the original Farrier's Formula® with the taste that horses love. 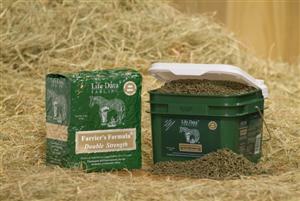 The Farrier's Formula® Double Strength 11 pound package delivers twice the number of daily doses compared to 11 pounds of original Farrier's Formula®. This equates to a 60 day supply for a 1000 pound horse at the Adult Replenishment Feeding Level or 120 days when feeding at the Adult Maintenance Feeding Level - with the added benefit of being more economical to feed compared to originalFarrier's Formula®. Farrier's Formula® and Farrier's Formula® Double Strengthprovide nutrients such as phospholipids, omega fatty acids, and important amino acid "protein building blocks" that enable horses to build strong structural and connective tissue proteins that are important for healthy hoof structure and growth.